No more issues such as misplaced menus, busy telephone lines, and order miscommunications. Add items to your basket with a single click. Order confirmation will be instantly sent to your email address or via SMS. Save Favorites orders for ordering via SMS! 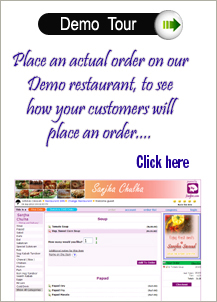 NEW - Place an Order from your mobile! Avail of special web promotions! Win Lotalty via Restauarnt Coupons!